During a Saturday afternoon practice, CCFA’s Carissa Purnell leads young members like Francisco Moreno in conditioning exercises at a local high school. It’s a late summer afternoon, and there’s a fierce competition taking place. On a pitch left dry as dust by drought and constant use, Mexico has taken the lead over Argentina, while three other soccer games swirl around coaches and parents shouting encouragement. This is the World Cup, and it’s being played with passion by youth at César Chávez Memorial Park, in the heart of East Salinas. Bordered by lettuce fields on one side, and modest housing on the other, the open space is home three times a year to free 10-12 week soccer clinics held by the César Chávez Futból Academy (CCFA). What began as an after-school program in 2010 has blossomed into a family of considerable size and positive influence in the community. The numbers speak for themselves. 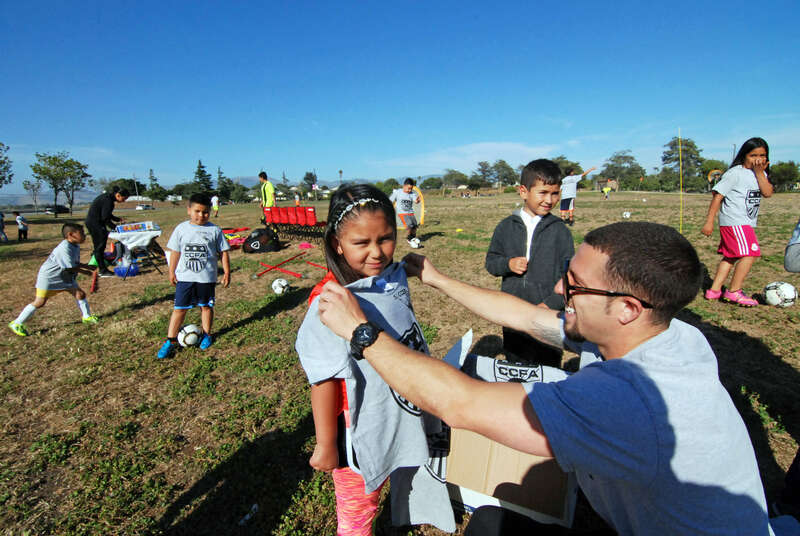 CCFA boasts five teams with a total of 90 players registered with U.S. Soccer, which translates to 450 children and families served through a variety of events and programs. Under CCFA’s wing, a few of these teams will travel to compete out of town for the first time in their young players’ lives. 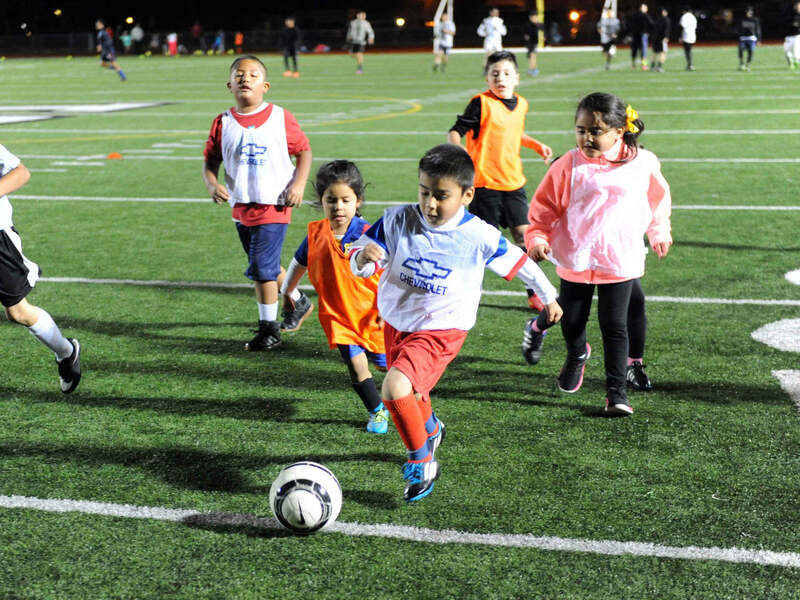 CCFA serves dozens of children through soccer clinics and frequent practices at a nearby middle school and under the lights at local high schools. Good grades are mandatory for players who make the cut, but the Academy offers tutoring and Saturday homework sessions for kids who need it. Thanks to this multidisciplinary focus on motivation, training, and academics, turnout was strong at signup this year. Now high school seniors, some of the youth who have been with the academy from the start are getting letters of intent from colleges, a source of intense pride for everyone involved. “As a person and as a leader, I’ve grown, being more respectful, being able to express myself better,” says high school senior George Aquino, who carries himself with a quiet confidence. Aquino, 17, comes to practice from nearby Castroville. At César Chávez Memorial Park in east Salinas, CCFA Program Director Anthony Velasquez uniforms Heidi Rodriguez, 5, with a brand-new CCFA t-shirt. Heidi’s older brother Iker is a young CCFA player who honed his skills at the group’s free clinics. In her previous job at the Cesar Chavez Library, Purnell made sure neighborhood kids could watch the 2010 World Cup there, and often played soccer with them on her breaks. 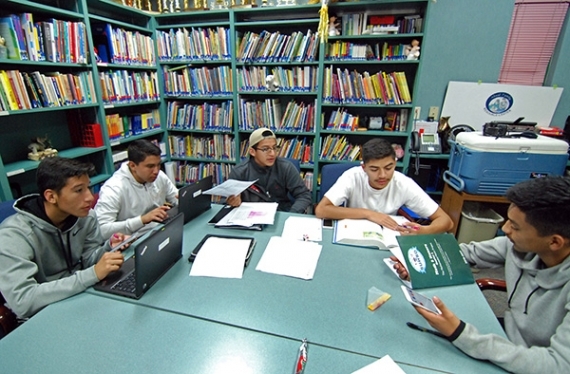 The Cesar Chavez Library has a comprehensive homework help program for kids. While doing some of their Cal State Monterey Bay (CSUMB) service learning there, tutors Anthony Velasquez and Craig Sterling agreed with Purnell, seeing a unique opportunity to contribute. They founded CCFA in 2010. Once homework was completed, kids would earn the chance to join Velasquez and Sterling, both college soccer players, in basic skills training nearby. Velasquez is emphatic about CCFA’s goal, motivating youth toward higher education and the world beyond. The Academy’s efforts soon outgrew the pocket park behind the library, moving to César Chávez Memorial Park in late 2011. Local businesses helped encourage the kids, donating equipment and other items, and word spread. “It’s crazy, just so crazy to think of where we are now in 2017, as opposed to when we started,” says CCFA Program Manager Sterling. Growth has been steady, and the staff has expanded to include coaches Troy Blank, Ruben Gomez, Amairani Rodriguez, and Peter Virgen, whose sons Omar and Jonny are young players to watch. “Building confidence, community and pride” is how Velasquez summarizes CCFA’s purpose. Players that have been with CCFA for some time have learned to juggle multiple responsibilities, a solid foundation for the kind of scholar-athletes the group is molding. And they have become mentors themselves, not just to other players, but to their own family members: “Pony” Avalos to his sister Stephanie, George Aquino to his exuberant sibling Arianna. By doing well in school, and excelling on the field, Jorge Solano, 17, knows he’s a role model for his little brother, who plays for United, CCFA’s Under-10 team. An evening study session finds the group’s highest level players doing homework and going over college application plans with CCFA’s Anthony Velasquez. From left, they are Osvaldo Avalos, Miguel Alvarado, Emmanuel Galvan, George Aquino, and José Caudillo. Community service isn’t just a high school prerequisite to graduate, it’s part of the fabric at CCFA. Nowhere is that better displayed than at the group’s Christmas Toy Drives, where in 2016, the teams created a whole holiday experience, gifts and more, for more than 400 area families. Young Juanito Canchola makes his move down the field during CCFA’s 2016 World Cup, which saw participants in the group’s most recent free clinics facing off as their favorite teams. Juanito’s older brother Fabian is a well-regarded player now coming into his own in a CCFA team. For more information about the César Chávez Fútbol League, visit www.ccfafutbol.org.